Bishop David Konderla is the fourth bishop of the Diocese of Tulsa in Oklahoma. From August 2005 until Pope Francis appointed him bishop on May 13, 2016, he served as the pastor and director of campus ministry at St. Mary's Catholic Center at Texas A&M University. He grew up as the second of 12 children in Bryan, Tex. Ordained as a priest of the Diocese of Austin on June 3, 1995, Bishop Konderla served in a number of pastoral diocesan positions for Austin prior to his appointment at A&M. He was ordained bishop on June 29 of this year. On June 22, I interviewed Bishop Konderla by email about his transition from Aggieland to Oklahoma. In mid-June you packed up your things in Texas, drove to Tulsa and made a retreat prior to your episcopal ordination. What will you miss the most about Texas A&M University’s Catholic student ministry? Campus ministry is a place of joy and challenge and eternal youth. Every year students graduate and every year a new group arrives. And it is the students I will miss most. Their amazing gifts, intelligence and desire to grow in faith were a constant source of inspiration. In the South, people sometimes call Texas A&M “the nation’s largest Catholic university,” referring to the demonstrably large number of practicing Catholic students and the disproportionately large percentage of them who enter religious life or the seminary each year. In your experience, how is this reputation deserved or undeserved? Everything is bigger in Texas and this is a fun Texas thing to say. There are almost 70,000 students at Texas A&M and Blinn College. About 25 percent of them are Catholics and the majority of those were practicing their faith and many of them were quite active, even disciples, bringing others to faith. So, there is some truth in saying it is the "largest Catholic university." We saw on average nine students enter seminary or novitiate formation each year, but I don't think we should call this a disproportionately large number. Rather, we should consider it a low number for every school and redouble our efforts so that every young person everywhere who is called by God to these beautiful, celibate vocations comes to understand that call and responds generously. Pope Francis named Michael Sis, your immediate predecessor at A&M from 1993 to 2005, as bishop of the Diocese of San Angelo in December 2013, making you the second consecutive pastor of St. Mary’s Catholic Center to become a bishop under Pope Francis. What is it about the pastor’s job at Texas A&M that might account for why the Vatican is now drawing bishops from there? The Holy Spirit calls who he will and if now a number of former campus ministry priests have been called to the episcopacy, it may be that God is reminding us that the future of the church and the world is right before us every day in our young people. The college years are a rich and graced time, and so campus ministry must not be an afterthought but made a certain priority. You have a reputation as a pretty handy craftsman, having carved a pastoral staff (crosier) for your predecessor Mike Sis when he was named bishop just over two years ago. Now you have carved another pastoral staff for yourself. What does carving mean to you, and why did you decide to make your own crosier for Tulsa? Woodworking is a wonderful hobby because it connects the craftsman to the soil and the sky and the wind and the rain that grew the tree whose wood you use. And if you harvest your own wood, this hobby can connect you to your own place, the place where you come from, the place that formed you into the person you are now. My life in Tulsa marks a new beginning, but that beginning is only possible because of the people and the schools and the churches and the pastors, even the pastor who planted the trees of the place where I came from. By making my own crosier out of wood that I know, "that I grew up with,” that I harvested myself, I can bring all of this with me wherever I go. How did the decade at Texas A&M influence your priesthood and help prepare you for episcopal ministry? Spiritually, the desire to feed and protect the sheep is heightened when they are so hungry. On the edge of adulthood we have lots of questions and a strong desire to know the answers. The new autonomy of adulthood exposes young people to lots of potential dangers. As a campus minister I wanted to feed and protect, to teach and preach, to assure my students of the mercy of God so they could over time learn lessons and make, where needed, new decisions. This desire on my part taught me to pray for wisdom and light and to recognize and preach and teach that obedience to the truth and the one who is truth is a form of love and that license is not freedom. Practically, campus ministry in a large setting like A&M means in some sense being pastor of a large family of people who live in parishes and communities spread out all over the state of Texas and beyond. Here I am referring to the families, friends, alumni and benefactors of the campus ministry. For that reason, I was often on the road a couple of days a week going out to visit people in many places. This is very similar to the form and rhythm of a bishop's life. 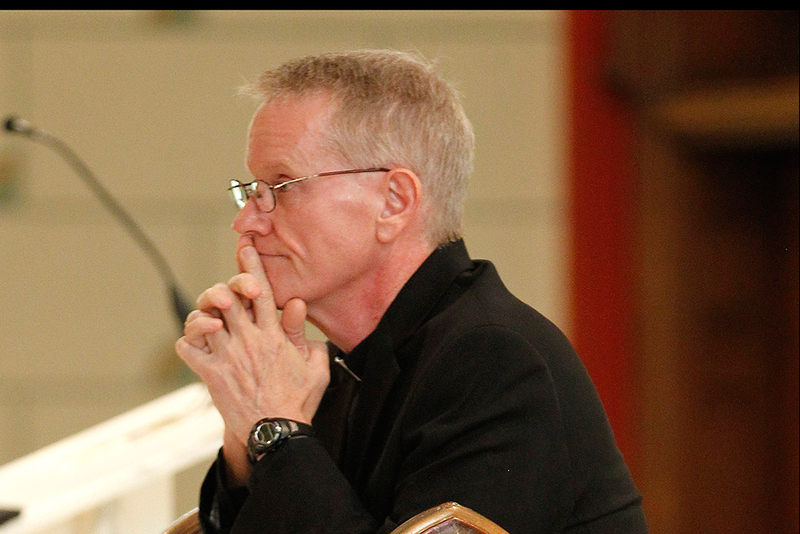 What do you hope to bring from your experience at A&M to the Diocese of Tulsa? My episcopal motto comes from Psalm 127, which says in part, "In vain is your earlier rising and your going later to sleep when he pours gifts on his beloved while they slumber." The psalm reminds us that because God is with us, we should not live and work as if he is not. We should trust him. It was in campus ministry that I learned to ask God each day in prayer for this grace of trust and I will certainly continue that practice as a bishop. What are some things you will take from the example and words of Pope Francis in your new ministry of bishop? Francis is an obedient son of the church and calls us to be merciful and faithful to what God teaches us through the church our Lord gave to us. This loving obedience is particularly needed now when the church will be in the forefront of protecting the United States from people in leadership who would weaken the freedom of religion of the citizens or who would harm the family through an ideological understanding of gender that does not correspond to the truth about the human person. If you could say one thing to Pope Francis about Texas A&M, what would it be? Pope Francis is often photographed giving a thumbs-up sign. I want to ask him if he is secretly an Aggie since that is the sign Aggies use and call the "Gig 'em." I begin the day early in the morning with a cup of coffee and praying the rosary. I imagine it as it must have been sometimes in the home in Nazareth with Mary and Joseph just talking and reflecting on events of the day. Then I like to go to a dark chapel with the Blessed Sacrament to spend time in quiet simply resting in the presence. Sometimes when I can I like to go outside and watch shooting stars. I love praying the office and talking to people in the confessional. The Mass each day is a special gift. When I think of the question in the way you have asked it, I think of God as a source of mercy and providence in my life. His mercy has allowed me to begin anew when I needed to but was afraid of my own weakness. His providence has reminded me often to trust his strength because he pours gifts on his beloved while they slumber. What people, living or dead, have had the greatest influence on your Catholic faith and why? By the time my parents were 43, they had 12 children. When I think of the willingness to trust God that is required to raise a large family, I am inspired to trust God in my own life and ministry. I know parents with children who have very special needs and who require constant care and attention. Such people are heroes of the faith. Matthew 4:18-22 has recently become a favorite. The last thing those disciples expected to happen to them that day while they were busy fishing and mending the nets was to be called right out of the boats to follow Jesus. My own call to be a bishop happened just like that and there is a peace and a joy and assurance in living out myself this passage of Scripture.